We used the 1.05-meter telescope of Pic du Midi equipped with a F/8 focal reducer. Our CCD camera was a LE2IM HiSis-44 (based on the chip Kodak KAF- 1600). The guiding system used a Proxitronic intensified camera and a Mylar beamsplitter transmitting 70% of the incident light. 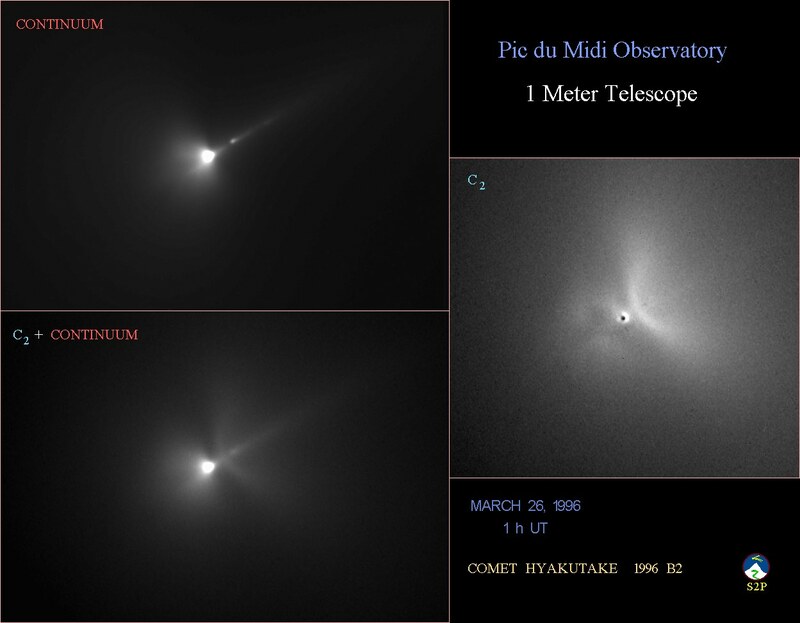 The "C2+continuum" (#1) image was recorded through an interferential filter centered at 515 nanometers. Its FWHM was 8 nanometers. The exposure duration was 9 minutes. Pixel binning of 4x4 was selected to boost the sensitivity of the detector, giving a scale of 0.85 arc-second per pixel. The "continuum" (#2) image was taken using a Schott RG 830 e=3 mm. The exposure time was 25 minutes, with binning 2x2 giving a scale of 0.425 arc-second per pixel. This filter is not a perfect continuum filter, but as the sky transparency was rapidly declining, broadband was needed. To obtain the final "C2" image, we scaled the image #1 to the same format than image #2 (i.e. 768x512), then we made the following substraction : Image #1 - K * Image #2 where the K coefficient was chosen in order to cancel the dust tail.